This is a die-cut J.E. Bauer Co. porcelain sign. This particular J.E. Bauer Co. sign is shaped like a paint can with touches of navy and red on a white background. It reads, “J.E. 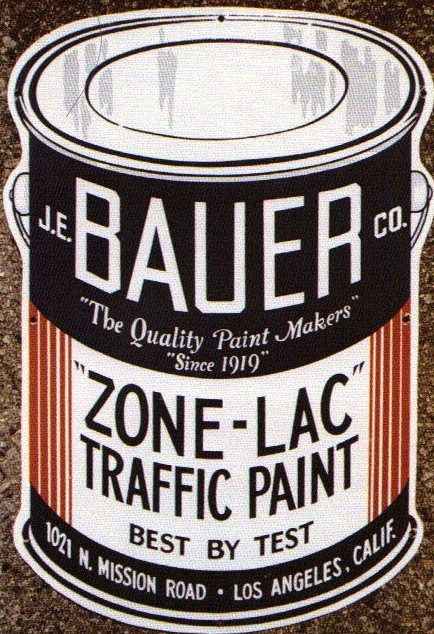 Bauer Co., The Quality Paint Makers Since 1919, Zone-Lac Traffic Paint, Best by Test, 1021 N. Mission Road, Los Angeles, Calif.”.